preheat oven to 400 degrees. Chop bell pepper and onion. In large pot, heat olive oil over med high heat; add bell pepper, onion and garlic. Cook 2-3 minutes or until veggies are tender. Stir in spaghetti sauce, ravioli and water. Bring to a boil. Meanwhile, cut French bread baguette into 12 slices, about ½ inch thick. Coat bread in melted butter evenly. Spoon half of the ravioli mixture into baking dish. Top with mozzarella cheese and add remaining ravioli mixture on top of that. Arrange bread slices that have been dredged in butter around edge of baking dish, press slightly into ravioli mixture. Grate parmesan cheese over bread and ravioli mixture. 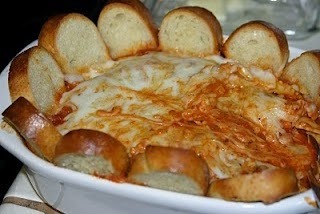 Bake 15 minutes or until ravioli is heated through and bread is crisp and deep golden brown.